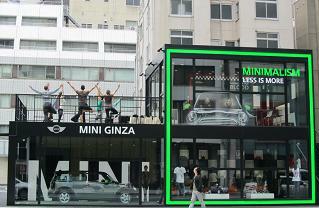 When I was walking in Ginza, I found a somewhat strange scene at the roadside. People were moving in the same way. Immediately I found that they were practicing Yoga…Yoga!? here!? I don’t know why they were doing Yoga over there, but the way they were moving was really cool as if it’s in an advertisement scene on a poster.